The fall season is fast approaching, and apples are now in season. 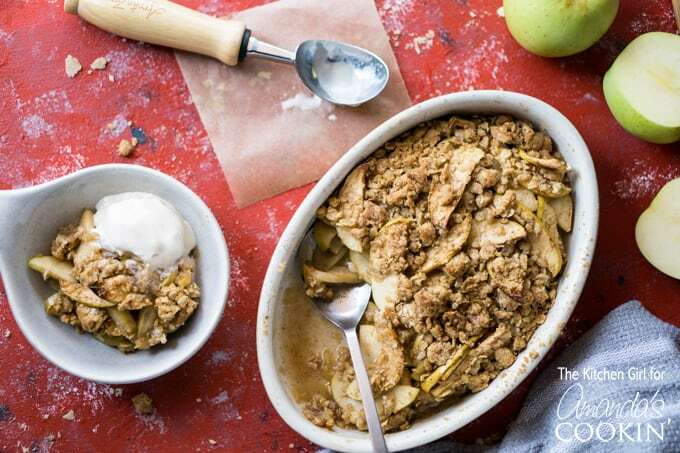 Do you have a reliable, go-to recipe for Baked Apple Crisp? You do now! This recipe has nine ingredients, apples being the key player, of course. The rest of the ingredients…you likely have laying around. 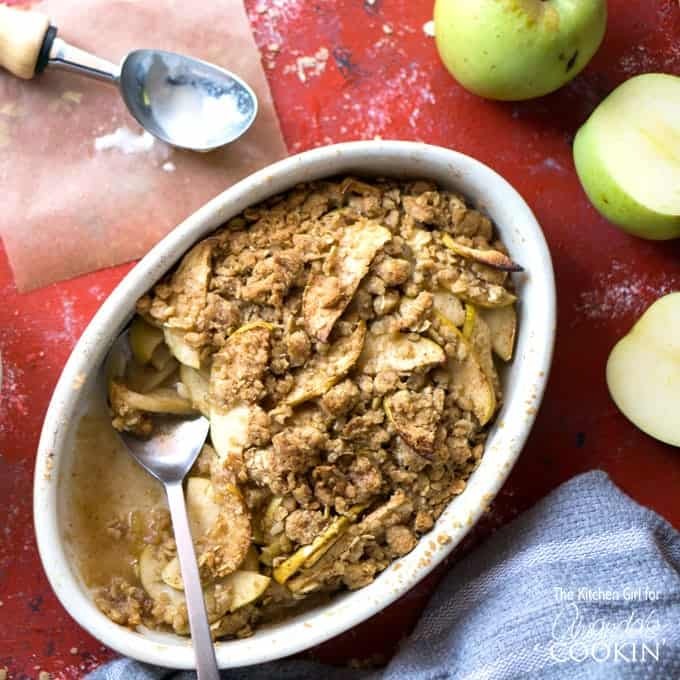 Another favorite dessert recipe around here is this Apple Cranberry Crisp. You just can’t go wrong with a fresh apple crisp and a scoop of ice cream on top. Oh, how I love the fall season and all of the cool-weather produce. It just makes me want to get in my kitchen to cook and bake fruity things. The thing is, I’m super-relaxed when it comes to making pie crust from scratch. Translation, I’m pretty lazy about it, so I’m always shouting praise to the pioneers of apple crisp and their (delicious) pastry shortcut. We have an apple tree in our yard, and I honestly can’t keep up with it during the season. 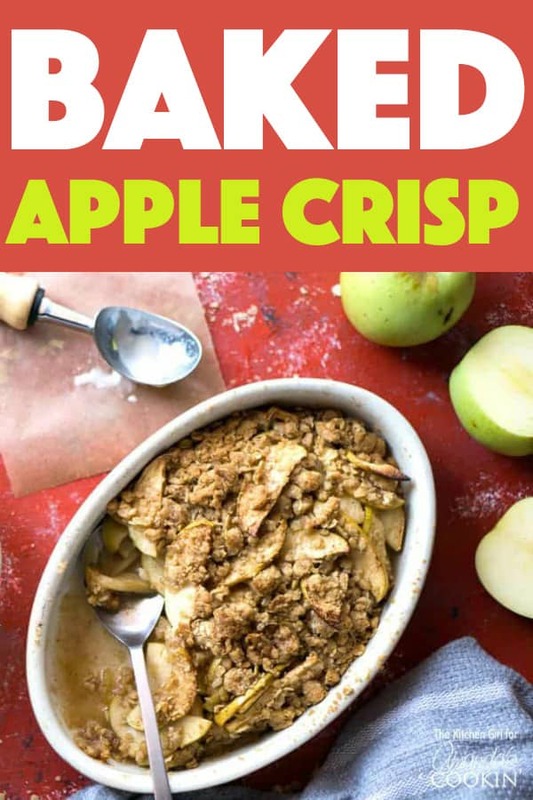 Thankfully, the season is long, which means many apple crisps will land in our bellies starting late summer, which is now, which is exactly why I’m bringing you this recipe. You may or may not have an apple tree, but I know you love the convenience and simplicity of this fruity, baked, comfort food that everyone loves, especially with a scoop of ice cream on top. If you want more fruit-inspired, fall dessert recipes, check out my Spanish-inspired Orange Olive Oil Cake with Dark Chocolate Ganache, or my Gluten-Free Peach Blackberry Crisp. Both are known for subtle sweetness that compliments the natural, fruit sugars. Brown sugar – you could substitute white sugar, but brown sugar gives a more caramel-like flavor. Flour – we used all-purpose flour, but wheat flour will work too. Rolled oats – also called old-fashioned oats, these are the ones you find in the Quaker oatmeal container. Cinnamon – this is a quintessential fall spice, but you can play around and add others if you like! Spices like nutmeg, clove, and allspice come to mind. Sea salt – If you don’t have sea salt, equal measurements of table salt will work fine. Unsalted butter – We use unsalted butter in all of our recipes. You can use salted butter, but you may want to cut the sea salt in half. Margarine is also an acceptable substitute. Apples – sweet varieties such as Gala, Golden Delicious, Fuji, and Honeycrisp work great for this recipe, Red Delicious will work as well. 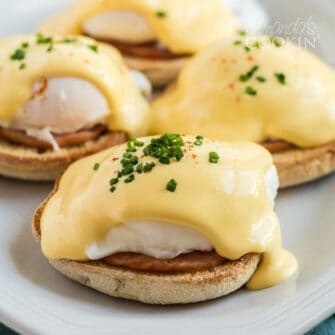 You can use tarter varieties if you prefer, you really can’t go wrong. Lemon juice – We never recommend using bottled or packaged lemon juice, it’s just too easy to buy a lemon and squeeze it and it’s a lot fresher! 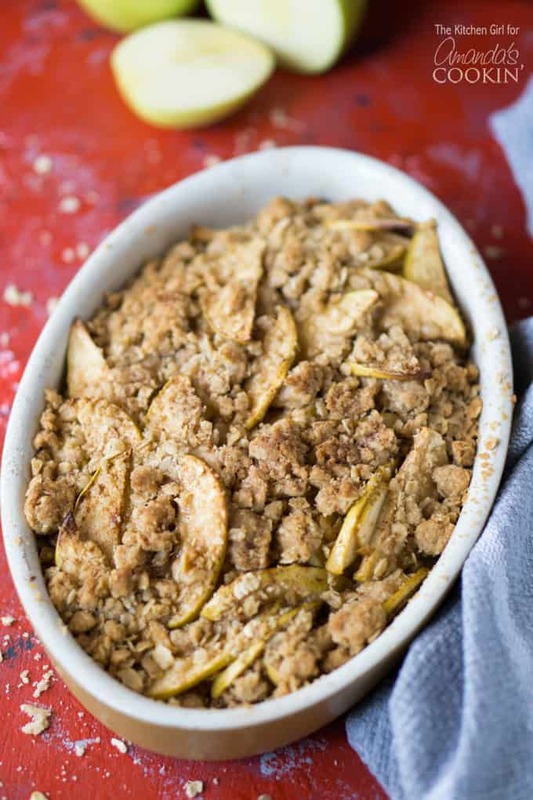 It’s important to note that you can use just about any sweet, crunchy apple for this recipe. In fact, I’m not sure I can tell you what apples not to use because I’m not convinced there are any that wouldn’t work. But, I always go with sweet and crunchy…and it always works! Oh, and no peeling necessary…unless you absolutely want to. Juicy, baked apples with a crispy, crumbly topping. Serve under a blanket of vanilla ice cream for a dessert that melts in your mouth. In a mixing bowl, whisk together brown sugar, flour, oats, cinnamon, and sea salt; add cubed butter and work it into the flour mixture with a pastry blender (or your hands) until mixture is crumbly. Cover and refrigerate until ready to use. In an oil-sprayed, 9 x 7 baking dish, spread out sliced apples; add lemon juice and cinnamon; toss to coat. Sprinkle the crumble mixture over the surface of fruit; Bake for 30-40 minutes at 350 degrees until topping is browned and fruit mixture is bubbling.